Last week, we talked about the digital humanities. For those who might be unfamiliar with the term, the digital humanities is a broad term that encompasses projects in many fields, from linguistics to history. In a nutshell, digital humanities, or DH, projects either seek to address humanities questions using digital tools, or, they use humanities questions and frameworks to consider how we interact with digital media. 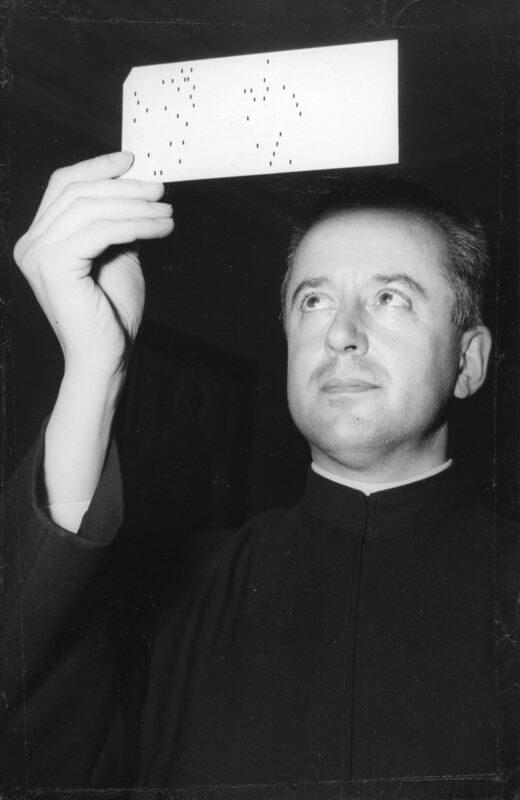 Roberto Busa, SJ, June 1956. An Italian Jesuit, Fr. Roberto Busa, is often recognized as the first person to “do” the digital humanities. Beginning in 1949, he teamed up with IBM to use computers to compile a concordance (an index of all the words in a work) of the works of Thomas Aquinas. Busa worked on this project for most of his life, and his data moved from analog form, to punch cards, to magnetic tape, to CDs and then onto the Internet. As computer technology developed, humanities scholars became increasingly interested in the possibilities of using computers in their work. The Amboyna Conspiracy Trial: A site exploring the Amboyna Conspiracy Trials. In 1623, on a remote island in Indonesia, Dutch colonial authorities accused a group of Japanese mercenaries and English traders of plotting to seize the castle. The site asks its visitors to weigh the evidence themselves and make a judgement in the case. Explore Common Sense: A project by three graduate students at Loyola University Chicago which creates an interactive, digital critical edition of the first British edition of Thomas Paine’s pamphlet Common Sense. Histories of the National Mall: This site explores the National Mall in Washington, D.C. with pictures, facts and thought-provoking questions superimposed over a map of the Mall. French and Spanish Missions in North America: This site maps the expansion of French and Spanish Catholic missions in North America over time. Discussion in class focused on how all four of these digital history projects tried to make history more accessible and interesting for the intended audiences. The general consensus was that participatory features, like the ones on the Amboyna site, were really important in making a site engaging and interesting, and to its ultimate success. Stay tuned as the Ramonat Scholars embark on their own digital project: mapping with Google Fusion Tables!